Visceral Games' sequel to sci-fi horror game Dead Space won't touch down on the PlayStation 3, PC and Xbox 360 until January 2011, but a new "interactive comic-style game" will hit those consoles this fall. The downloadable Dead Space Ignition will take place just before the events of Dead Space 2 and will pack in a "satisfying arcade experience that will challenge players with puzzles and twitch gameplay," according to the official announcement. Dead Space Ignition "combines an interactive comic-style story with three unique hacking mini games; Hardware Crack, Trace Route and System Override." The "choose your own adventure" style interactive comic is written by Antony Johnston, responsible for the Dead Space comic book series published in 2008. 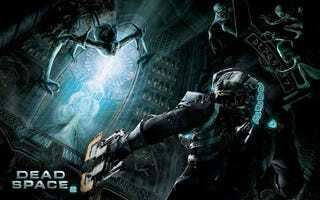 While details of Dead Space 2's downloadable games have changed, when Kotaku first reported on them, publisher Electronic Arts had plans to possibly charge players for the releases. Dead Space Extraction, Planet Cracker Coming To XBLA, PSN? Completing the Xbox Live Arcade and PlayStation Network bound Dead Space Ignition unlocks goodies in the retail release of Dead Space 2, including a special suit for Dead Space hero Isaac Clarke. Dead Space Ignition is being developed by Visceral Games and Sumo Digital.